As the nation moves toward deployment of autonomous and connected vehicles, safety remains a top priority for public and private sector leaders alike. Self-driving technology promises to improve safety by removing the potential for human error, which contributes to an estimated 95 percent of accidents. However, highly publicized accidents involving autonomous test vehicles have raised the question: Can such vehicles truly be safe? According to the HNTB survey, almost six in 10 (59 percent) Americans believe that autonomous vehicles are not as safe as vehicles operated by people, and 55 percent would be unwilling to ride in an autonomous vehicle today. It’s likely that some of this perception stems from intense media coverage of any crash involving self-driving vehicles. However, safety concerns appear to vary based on age. 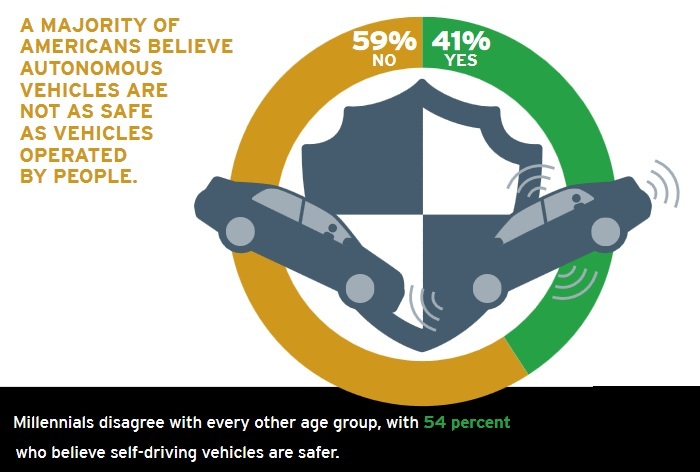 A majority of millennial respondents (54 percent) believe that self-driving vehicles are safer, and 60 percent of this same group would be willing to ride in such a vehicle today. This indicates that emerging generations, accustomed to adopting the latest technologies, may represent a wide-open market for autonomous vehicles and services as these capabilities become more refined. Here in America, about 40,000 people die in traffic crashes each year. Globally, road traffic injuries are the leading cause of death for young people (ages 15-29) and the ninth leading cause of death for all age groups. There is general agreement that technology refinements in vehicles and the infrastructure along our roadways can someday enable us to travel our roads without crashing. This is why, despite the risks endemic to testing, automakers and other innovators must continue to experiment, with great diligence to ensure that these new vehicles can react safely to every possible scenario that they encounter in the real world. Beyond ensuring safety, all of us in the transportation sector must help to communicate the many benefits that these emerging technologies will bring to society. For one thing, widespread availability of autonomous vehicles may help commuters turn currently idle time into productive output. The average American now spends just under an hour, round trip, in a daily commute, according to the Census Bureau. Imagine the potential economic impact when people can choose to work while traveling in autonomous cars. The car becomes another workplace. This new technology can bring entirely new transportation options to those who currently have limited mobility. When HNTB survey participants were asked to identify benefits that automated vehicles will bring, 51 percent identified new transportation options for non-drivers, such as the elderly or people with disabilities, as the single most important benefit. Providing improved mobility to these population segments would be transformative. Significant economic benefits also could accrue to currently underserved populations who would have access to broader mobility options to get to and from jobs and health care providers. Intermodal connectivity will mean that people can more easily transfer between modes of travel, from bikes to cars to buses and ships, to trucks to trains and airplanes. Autonomous vehicles can provide the bridge between modes, as users share rides and vehicles to spark “mobility as a service” on a grand scale. In such a scenario, people could electronically “hail” an autonomous vehicle to their front door from a smartphone, and then ride to the nearest train station or airport. This idea holds some appeal already. When the HNTB survey asked people about the potential use of autonomous vehicles once they are readily available, 37 percent overall cited travel between transit stations and airport terminals as the most common usage. That number was higher, 52 percent, among seniors (age 69+). As this transportation revolution accelerates, it is important that we create long-range plans that are ready to take advantage of what the tech-driven future has to offer. This way we can ensure that our system will not only look significantly different from what we see today, but it also will provide smoother connections between transportation modes, and broader mobility options for all. Most importantly, safety will continue to be the primary driver of our efforts. As these automated systems advance, we will move toward our ultimate goal — zero traffic fatalities nationwide.